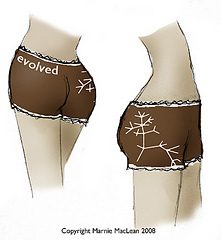 Get your Intelligent Behind into a cute little pair of boy shorts and express your love for rationality, reason, and the man with the plan, Charles Darwin. 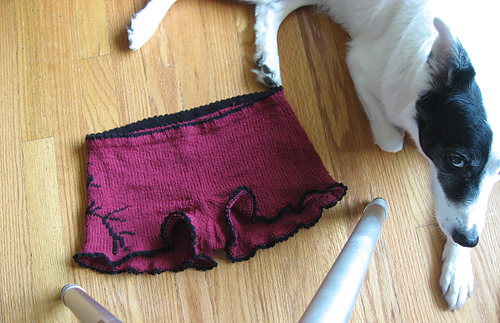 These shorts are knit top-down and in the round, so there’s almost no finishing. 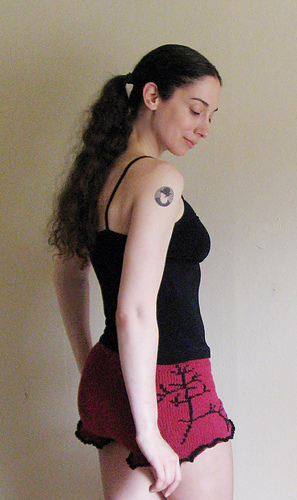 If you want to skip the duplicate stitch motif, you can have these quick little knits on your tuckus in no time at all. Assets of Evo are worked in a super stretchy yarn called Esprit, made of cotton and elastic. 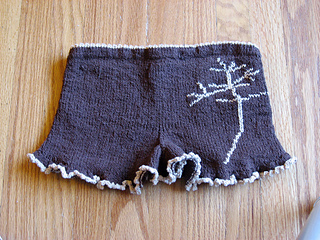 Knit with a bit of negative ease, with the yarn held loosely, these shorts hug the body. Refer to the chart below to find the best fit for your hip measurements. Throughout the pattern, you’ll find notes on customizing the fit. But don’t forget, modifications may require extra yarn, so plan accordingly. US #5/3.75mm circular needle. Length should be at least a few in/cm shorter than your waist circumference. 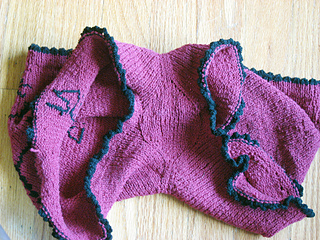 This garment is worked with negative ease (approximately 3-5”/8-13cm.) Please use the measurements above, not the schematic, to determine which size will fit you best. Schematic lists finished garment measurements only. Notes and fitting tips will appear throughout the pattern, format- ted like this. 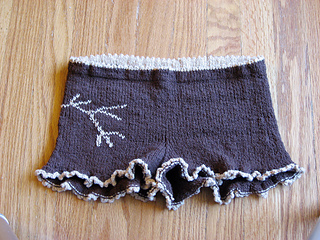 Pattern begins at the waistband, which is worked with a provisional cast-on so that it can be closed without any seaming. Short rows are placed below the waistband in the back to add length to ensure good coverage. You may work more or fewer short rows to suit your shape. From there, the garment is worked in the round, increasing at the side seams to accommodate the hips. 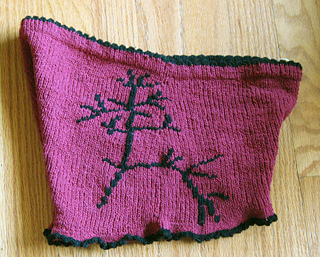 The crotch is worked straight down the middle and then the increases split to form a gusset that will eventually be seamed with either grafting or a three-needle bind-off. 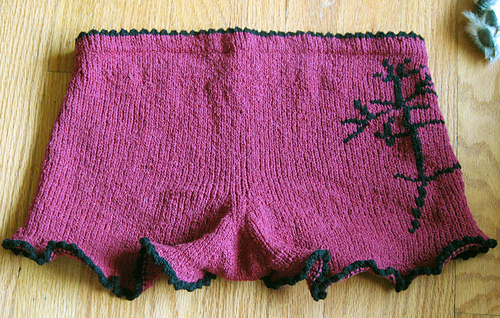 A few more short rows are added to the back to lengthen the garment and the crotch further. Finally, the legs are worked individually in the round, and completed with a short ruffle and contrasting picot bind-off. IMPORTANT: Do not hold the yarn too tightly or you’ll negate all the built in elasticity. It’s fine to have a little tension on the yarn, but be sure you aren’t knitting so that the yarn is completely taut. 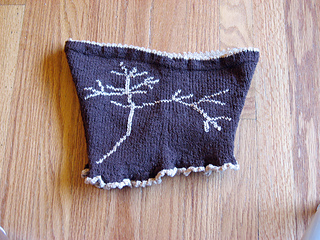 When you complete your swatch and get gauge, your fabric should still have plenty of stretch. If it doesn’t, try relaxing a little or don’t wrap the yarn so tightly around your finger for tension.